The mystery of the Soviet-era camera discovered recently by hikers in the Columbia Gorge may never be solved. Certainly, the film inside the Exakta camera found near the remote Eagle Creek waterfalls won't yield any clues. Ron Campbell, one of the hikers, said Portland's Blue Moon Camera & Machine wasn't able to retrieve any photos after applying a special development technique that reversed the chemistry of how the film is processed. Since the back of the camera was cracked open and the film canister was punctured, Campbell said they didn't have high hopes about photographs being salvaged. "With the gelatin used on the old film, it was no good," Campbell said. Nothing." 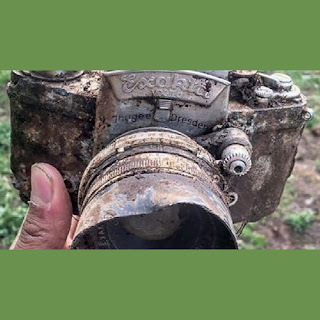 For nearly a month, Campbell and fellow hiker Ethan Field, who filmed the discovery of the Cold War relic, have been searching for clues to how the camera wound up in the mossy muck of a remote area in the Gorge. Both men live in Hood River. The vintage camera is inscribed with the words "Made in East Germany/U.S.S.R. occupied." After their discovery went viral on social media, the two men joked that the camera was used in espionage or contained images of Bigfoot. There was also the Jimmy Stewart theory: Two years before using the same left-handed Exakta model in "Rear Window," the legendary actor was in the Gorge filming "Bend of the River." Another possibility: Jimmy Stewart's daughter attended Lewis & Clark College during the late 1960s. Maybe she hiked up there in the Gorge and lost her dad's camera. But without any further evidence, the camera might as well be the lost property Nikita Kruschev, D.B. Cooper or someone's Uncle Saul. In fact, many camera experts say, despite the Exakta's Cold War mystique, it was widely available beyond the Iron Curtain. One positive thing to come out of the search so far: Campbell saw "Bend of the River." Two weeks ago, he didn't even recognize Stewart's name. "Funny how they had a horse and carriage and cattle at Timberline," he said. "Didn't know the Oregon Trail pioneers summited the Hood!" The Hollywood Theatre has also contacted the pair about speaking about their discovery at a special screening of "Bend of the River." Campbell and Field are still looking for the owner.